Garden of Dreams Learning Center, Founded and Supported by Larger Than Life, begins Its second year, 2015-2016. We are proud and excited to open the second academic year at the Garden of Dreams Learning Center at Kfar Azar. Twenty-six children, ages 1-6, will be in our preschool this year. The school is at full enrollment again, and the children's happy voices, the sounds of music, and the sweet aroma of baking goodies fill the air. Our wonderful staff spared no effort to create a warm educational environment to match each child's learning level. Garden of Dreams aims to improve the lives of children with cancer by improving their quality of life, developing appropriate educational services, increasing awareness of the children's lives among the community and the general public, and engaging volunteers and others to ease the children's struggle. 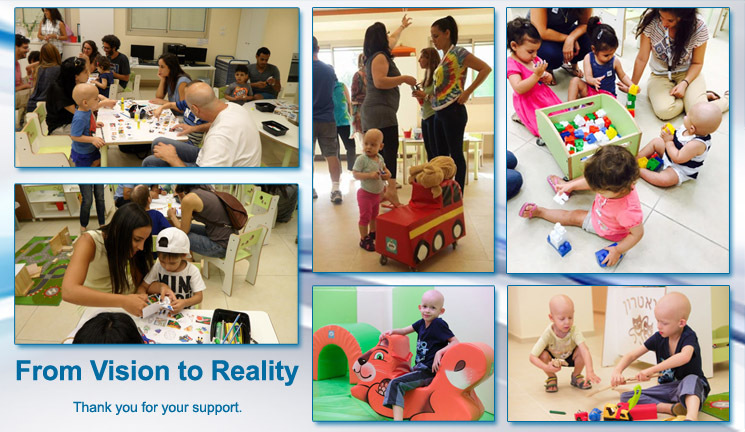 We believe that it is important to give the children all possible support to enable them to fight their illness.